Натисніть на фотографію і подивіться всі доступні фотографії до Hotel King. Air-conditioned room with TV, minibar and private bathroom. Please specify bed preference when booking. 2 Задасте дату а виявите наявність, зобразяться а й ціни готелів на даний час. Air-conditioned room with TV, minibar and private bathroom. 3 Задасте дату а виявите наявність, зобразяться а й ціни готелів на даний час. Air-conditioned room with TV, minibar and private bathroom. Some rooms feature a balcony. 4 Задасте дату а виявите наявність, зобразяться а й ціни готелів на даний час. Situated in the most exclusive area of Rimini's seaside, only 50 metres from the beach, Hotel King welcomes you to the fabulous Riviera Romagnola. 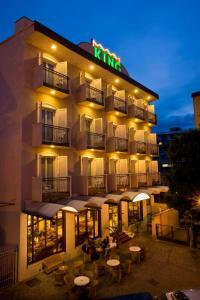 Hotel King is well connected to the city's historic centre and to the congress centre and the trade fair centre. From the end of June to the end of August, the hotel is only bookable for weekly stays, from Saturday to Saturday.